The book "Programming Basics with C#" has a long story behind, involving many contributors, developers and trainers, who share their knowledge and skills to teach the new generation how to program. Watch a video lesson about the trainers and contributors who developed this book and video course here: https://youtu.be/z_6I_mU0tv0. The general head of the project for creating the free programming book for beginners with an open-source code is Dr. Svetlin Nakov. He is the main ideologist and author of the learning content of the free training course "Programming Basics" in SoftUni, which was used as the basis of the book. Everything started with the mass free basic programming courses that have been conducted in the whole country since 2014, when the "SoftUni" initiative was launched. At the beginning these courses had larger range and covered more theory, but in 2016 Dr. Svetlin Nakov completely revised, updated and simplified the whole method of teaching, strongly emphasizing on practice. This is how the core of the learning content of this book was created. The free courses at SoftUni for a start in programming, are probably the most massive trainings ever conducted in South-Eastern Europe. Until 2017 the course in programming basics was held over 150 times, in around 40 Bulgarian towns and cities in person and multiple times online with over 50 000 participants. It was completely natural to write a book for the tens of thousands of participants at the SoftUni basic programming course. The book was initially written in Bulgarian language in 2017 and later translated into English in 2019. The project is part of the hard work of the Software University Foundation to create and distribute an open learning content to teach software engineers and IT professionals. Aleksander Krastev, Aleksander Lazarov, Angel Dimitriev, Vasko Viktorov, Ventsislav Petrov, Daniel Tsvetkov, Dimitar Tatarski, Dimo Dimov, Diyan Tonchev, Elena Rogleva, Zhivko Nedyalkov, Julieta Atanasova, Zahariya Pehlivanova, Ivelin Kirilov, Iskra Nikolova, Kalin Primov, Kristiyan Pamidov, Luboslav Lubenov, Nikolay Bankin, Nikolay Dimov, Pavlin Petkov, Petar Ivanov, Preslav Mihaylov, Rositsa Nenova, Ruslan Filipov, Svetlin Nakov, Stefka Vasileva, Teodor Kurtev, Tonyo Zhelev, Hristiyan Hristov, Hristo Hristov, Tsvetan Iliev, Yulian Linev, Yanitsa Vuleva. Book cover design: Marina Shideroff. English translation lead and editor: Nelly Karaivanova. Translators: Bilyana Borislavova, Kalina Milanova, Karina Cholakova, Marieta Petrova, Mirela Damyanova, Petko Dyankov. The entire project for creating this book, videos and teaching curriculum for beginners in programming is driven by Svetlin Nakov who inspired the other contributors to join this project and share their knowledge and skills. 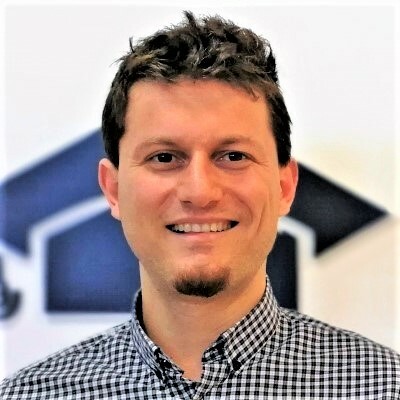 Dr. Svetlin Nakov (https://nakov.com) is a passionate software engineer, inspirational technical trainer and tech entrepreneur from Bulgaria, experienced in broad range of languages, software technologies and platforms. He is co-founder of several highly successful tech startups and non-profit organizations. Svetlin is training, innovation and inspiration leader at SoftUni – the largest tech education provider in South-Eastern Europe. Svetlin has been a speaker at hundreds of conferences, seminars, meetups, courses and other trainings in the United States, Singapore, Germany, Egypt, Bulgaria and other locations. He holds a PhD degree in computer science (for his research on computational linguistics and machine learning), several medals from the International Informatics Olympiads (IOI) and the Bulgarian President’s award “John Atanasoff”. He has been a part-time lecturer / trainer in Sofia University (Bulgaria), New Bulgarian University (Bulgaria), the Technical University of Sofia (Bulgaria), Ngee Ann Polytechnic (Singapore), Kingsland University (USA) and few others. Currently Svetlin Nakov together with his partners drive the global expansion of the largest training center for software engineers in the South-Eastern Europe and the region – the Software University, where he inspires and teaches hundreds of thousands of young people in computer science, software development, information technologies and digital skills, and gives them a profession and a job. This is the official book site and any new version will be uploaded there. The book is mirrored in the other programming languages mentioned on the website. If you prefer a different language, select it from the list above. This book is an official textbook for this Udemy course and serves as detailed tutorial, extending the course content with additional topics and more detailed explanations. In this discussion forum you will get proper response to any question associated with the content of this book also any other questions about programming. The SoftUni community is so big that you will get a response within a few minutes. The trainers, assistants and mentors at SoftUni also responds on your questions. Because of the big number of learners, you can find in the forum practically any solution of any exercise, shared by your colleague. Thousands of students already got the answer on the same exercise, so if you are late you can check the forum. Even though the exercises in "Programming Basics" are changing at some point, the sharing at SoftUni is always welcome and encouraged, that&apos;s why you will easily find solutions and guidance in any exercise. If you do have a specific question, for example if you spend many hours on certain piece of code and it doesn&apos;t work correctly, you can always ask in the forum. You will be surprised how friendly are the SoftUni&apos;s forum participants. We do not promise to fix everything you send us, but we do want to always improve the quality of the book, so the reported errors and reasonable suggestions will be reviewed.